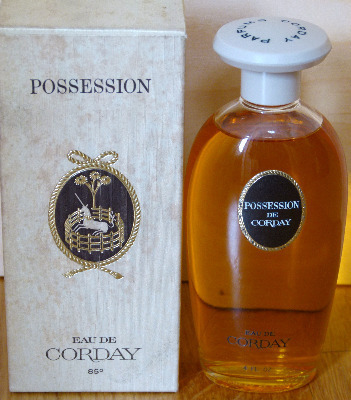 Vintage Corday Possession, available by the ml. Brand new old bottle. We really don't know much about Possession, except that it came out in 1939. The company was named after the woman who murdered Marat, the French revolutionary. They just don't do brand names like they used to. Voted second favourite in Odette Toilette's recent Scratch + Sniff event, The Valley of the Lost Perfumes. It's a big traditional white floral. Safety stuff: Obviously, this scent was made long before the current EU regulations and IFRA voluntary guidelines, so we've got to recommend that you don't put it on your skin.